The genus Paulownia (in the family Scrophulariaceae) includes about nine highly productive species with valuable timber. They are native to southeastern China, where they have been cultivated for centuries. The species of Paulownia genus have C-4 type of photosynthesis and are placed among the fastest growing species in the world. They are foliage timber and evergreen in tropical areas. The bark is smooth with branches in opposite direction. The trees form many large gramophone flowers with many small seeds that possess small skin wing and high tolerance to changing environmental conditions. Of high importance are the species P. tomentosa, P. elongata and P. fortunei. Paulownia is interesting with its fast growth, high quality timber, beautiful flowers and large leaves. All the species of Paulownia genus are fast growing but the most attractive for commercial use are hybrids among these species that maintain different valuable characteristics. The high drought resistance, unpretentiousness towards the soil composition and the broad range of temperatures for growing (from -20 to +40oC) makes the Paulownia species highly sought on the world market. The timber of Paulownia is light and at the same time exceptionally strong, which is the ideal combination for the cases where such ratio matters. The timber easily allows all types of treatment. It is light in color and it stains well with all varieties of colors. It is used for furniture, veneer, rafts and panels, toys and as the raw material for paper, biofuels etc. The high ratio of strength/weight makes the Paulownia timber irreplaceable in shipbuilding, aviation, for surfboards, caravans etc. The Paulownia timber can be air-dried fast (without kilns), and it retains little moisture (up to 10-12%). It is exceptionally stable, withstands warping, breakages and deformations. The timber is with fine structure and silky smooth surface, without blemishes (knots). It is water-resistant and with amazing resonance which makes it highly valued and sought for musical instruments. It is also very important that these species resist illnesses, insects and pests which considerably reduce the risks of commercial growing. The use of Paulownia in Japan dates back to 200 AD. Traditionally, when Japanese couples have a daughter, they plant a Paulownia tree. When the daughter is ready to marry, they cut down the tree and make a dowry chest, furniture and other items out of it for wedding gifts. Ancient Lore has it that if they planted a Paulownia tree near their house, the legendary Phoenix would come across their land and bring prosperity and wisdom to them. In China, the Paulownia has been grown for centuries and its timber was used for furniture, construction components, toys, musical instruments, boxes, packing, etc. 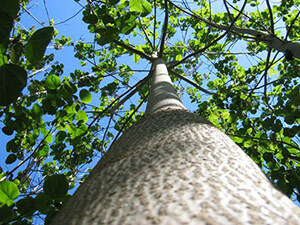 The fast growing species of Paulownia were selected for the production of light and strong timber. These tree species today are produced from tissue cultures and grown in well maintained plantations. Such specialized plantations are opened often in the Orient. 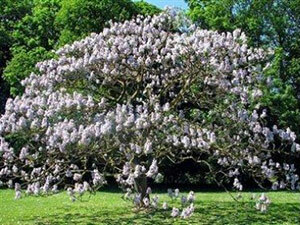 In China only, there are more than 1.2 billion Paulownia trees growing. Fast developing programs for planting and growing Paulownia are performed in Australia, New Zealand, Central, South and North America. In the 90-ties, in the southern and southeastern states many plantations for Paulownia were established. Presently, they are the sources for the fast supply of high quality timber.